In other news, I'm running another GIVEAWAY! 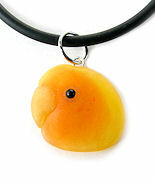 This time the prize is a cute lovebird necklace. I sculpted this bird face from a new type of clay, that looks like frosted glass, but is very lightweight. Enter to win here. You can earn extra entries by "Liking" my Facebook pages: Alicia's Creations on Facebook page, ARTdornments on Facebook, and Joy Magnet Art on Facebook, or by following my Twitter accounts as well, but these are not mandatory. The giveaway is open to residents of the USA, age 18 and older, and ends on December 8. Good luck! The gorgeous colors of autumn are surrounding me and providing endless inspiration, so it's no wonder that this Flights of Fancy collection features some birds in fall and earthy colors. 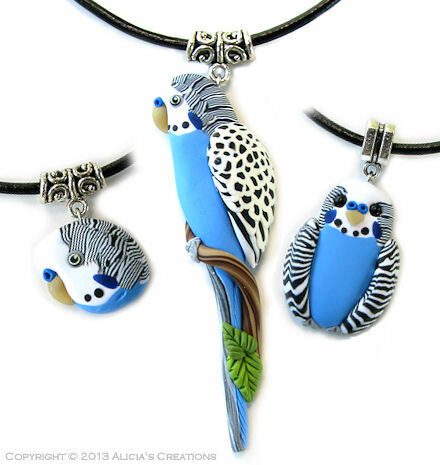 Each bird has several tiny sculpted leaves, as well as the word "LOVE". The birds were sculpted from shades of brown clay, with metallic gold, silver and copper highlights. 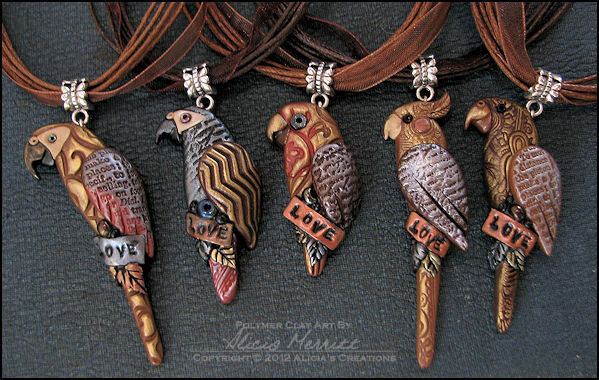 All five pendants are strung on brown ribbon/cord necklaces. 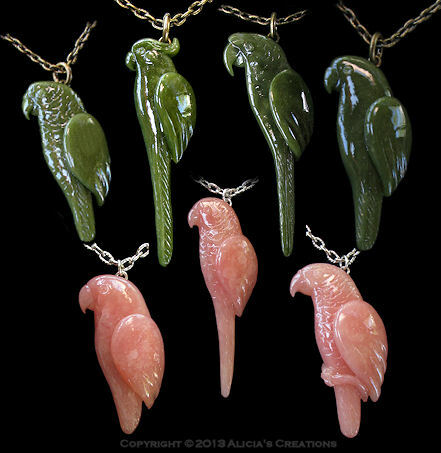 The species represented from left to right are: Macaw, African Grey, Lovebird or Parrotlet, Cockatiel, and the last one could be a Brotogeris or a Lorikeet/Lory - though they are all open to whatever species YOUR imagination can see! 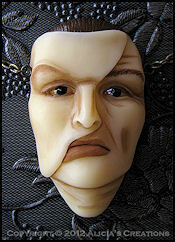 There is also another Phantom Face in Faux Ivory necklace on sale this week on eBay. All of the pieces are being auctioned on eBay for the next five days. On a side note, I just received an email from eBay congratulating me on my 10 year Anniversary of being a seller! Time sure flies, it doesn't seem like very long ago that I was just getting started selling my creations online! Here are some unique new feather earrings, with feathers donated by own Eclectus parrots! The two pairs of earrings are on eBay for the next 5 days. 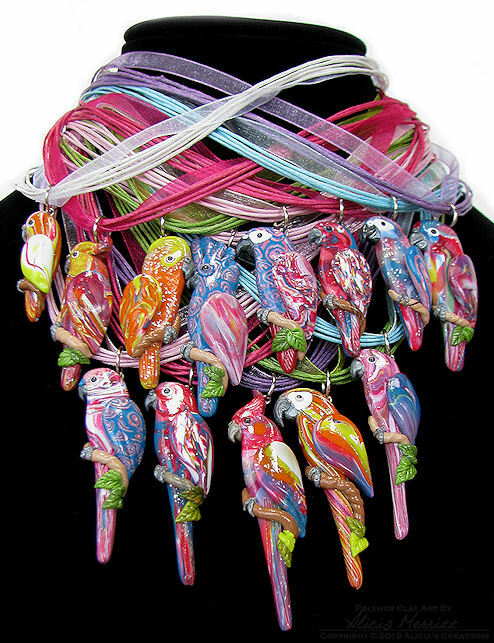 This African Grey necklace was created in my whimsical Flights of Fancy style, with the word LOVE and glass beads embedded on it. All of the items are being auctioned on eBay until Sunday!